Arab media has reported that a number of Palestinian children hurled stones at Prince William’s convoy as he drove near Ramallah. Journalist Khaled Abu also reported that Palestinian children threw stones, reporting that no one was hurt and no damage was done. A few Palestinian children threw stones at Prince William's convoy in Jelazoun refugee camp, north of Ramallah. No one was hurt and there was no damage. According to Jalazoun Center for Community Media, residents of the Jalazun refugee camp did not participate in the reception. Only some of the children who were noticed by the large attendance of the security services and the families living in the neighborhoods were present. 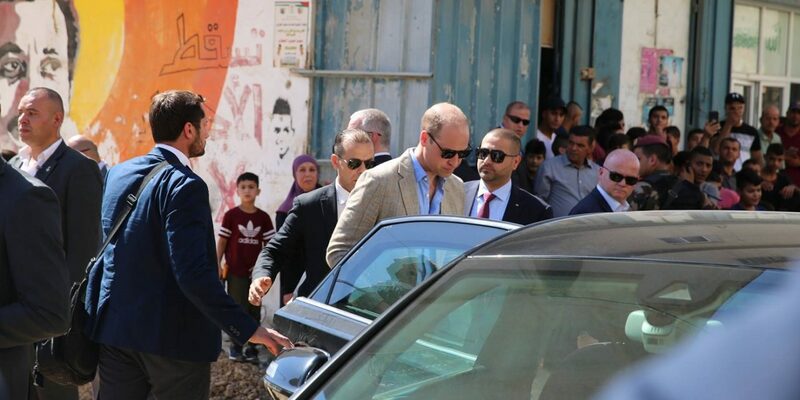 The report also claims that Prince William was accompanied by official figures from the Palestinian Authority and others from UNRWA, while the Popular Committee, which represents the residents of the camp or any official figures from the camp, was not included in the tour. However eyewitnesses told Quds News that a number of members of the Popular Committee were present in the area during the arrival of Prince William, but they did not participate in the reception and did not shake hands. Meanwhile, Chairman of the People’s Committee Mahmoud Mubarak told Quds News that the residents of the camp circulated about their boycott of the visit and did not participate in the reception, saying only that they were in the area during the visit. Scores of security guards accompanied prince as he was shown around Ramallah, one day after Israel’s president urged him to take a ‘message of peace’ to the Palestinian leader. The Duke was given a tour of a clinic and school run by UNWRA, the UN body for Palestinian refugees, and met Palestinian youths to eat hummus and other local dishes. He also attended an Arab cultural event where he watch a traditional Arab folk dance. He also joined in for some football with Palestinian children. Speaking at the British Consulate in Jerusalem on Wednesday evening after his Ramallah visit, Prince William said he saw “an unforgettable display of Palestinian culture and hospitality” in Ramallah. “My message tonight is that you have not been forgotten,” the prince said. He said he hoped his visit will strengthen the friendship between the Palestinian and British people. “The United Kingdom stands with you as we work together for a peaceful and prosperous future,” the prince said. After the speech he spoke to groups of people, including some residents of Gaza, Palestinian politicians, and members of youth organizations.